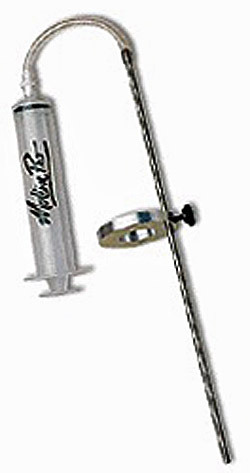 Motion Pro gauge for checking and adjusting the oil level on all conventional and inverted forks. Adjustable ring will measure oil levels from 0-300mm in 0.5cm increments. Syringe has capacity of 60 ml. As well as motorcycles, this tool can be used on all bicycles that have front suspension. Also replaces Harley Davidson tool HD-590000-B and Buell tool B-590000-B.